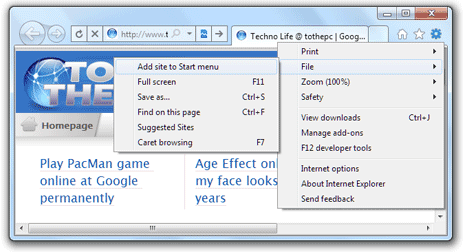 Internet Explorer 9 has lot of new features that extends functionality and ease on Windows 7 computer. Besides the traditional favorite marking of websites, you can pin favorite websites on the start menu and taskbar for even quicker access. IE9 allows you to add any website to the start menu on Windows 7 PC. Further, you can add that favorite website to the taskbar for single click access. 1. Launch Internet Explorer 9 and open any website that you want pin. 3. In the pop-up dialog box confirm on website URL and click ‘add’ button. This will add specific website to the Start menu on Windows 7 PC. 4. One website is added to the start menu, you pin it. Click on Start (Orb) button and then right click on added website. 5. 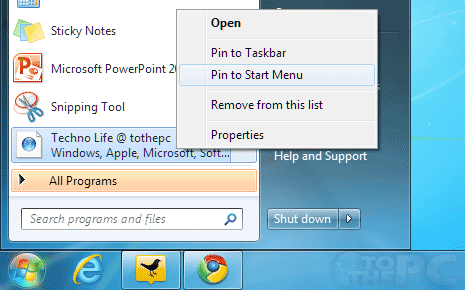 Click on ‘pin to taskbar’ or ‘pin to start menu’ to add specific favorite website to taskbar or start menu respectively. For sure one quick way to access favorite websites without too many clicks. You can add and pin multiple favorite websites as per requirement using above procedure.